When folded, the $15 Urban Shelf is just a half-inch thick so it won't take up much room when buried in your suitcase. 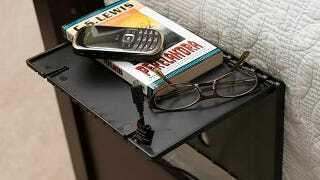 And when deployed, a lip designed to slide under a mattress lets this sturdy shelf hold up to four pounds of overnight sundries, including your glasses and phone. It's even got a couple of strategically cut slits designed to prevent your charging cables from sliding off onto the ground when you unplug your toys. If you ever find yourself in a hotel room where the nightstand kept your phone just out of reach, you'll realize why this is truly an ingenious creation.